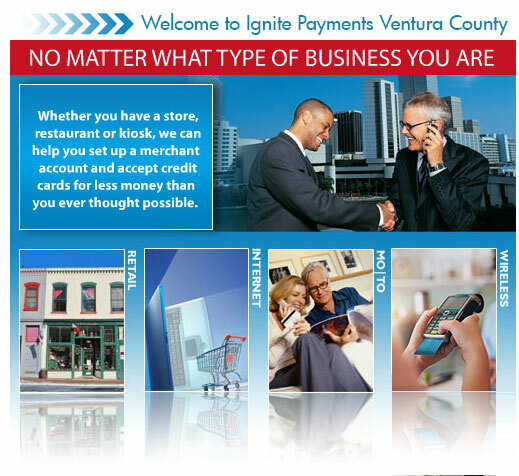 Welcome to Ignite Payments Ventura County, An independent agent office of Ignite Payments. Our merchant services provide you with everything you need to allow your business to grow and start accepting credit cards today! Partner with Ignite Payments today so your business can grow and accept credit cards today! Accept Credit Cards with Ignite Payments - Accept Credit Cards Today!! Ignite Payments, a wholly owned subsidiary of Ignite Payments Corporation, is an industry leader in credit card processing for traditional and Internet business. We offer merchants competitive pricing, customer service 24 hours a day, 7 days a week, in more than 140 languages and dialects, and access to one of the largest and most effective credit card fraud, loss prevention and chargeback departments in the industry. Accept Credit Cards Today! Why Ignite Payments? Ignite Payments provides the expertise and reliability to enable merchants to accept credit cards, ATM/debit cards and checks. From the establishment of a merchant account to technologically sophisticated secure payment gateways, Ignite Payments provides a one-stop shop for all types of transaction processing. Accept Credit Cards Today! Get a Merchant Account Sign up today! Applying for a Ignite Payments merchant account is easy. We maintain one of the highest approval rates in the industry. Complete our Merchant Inquiry form and an Ignite Payments representative will contact you within one business day. Accept Credit Cards Today! Partner with Ignite Payments Today! Specializing in small and medium-size businesses in both traditional and Internet environments, the Ignite Payments Referral Partner Program provides flexible and secure products and services that enable merchants across the nation to accept nearly all types of electronic payments. Ignite Payments also helps our partners develop customized programs and materials to reflect their branding requirements. Accept Credit Cards Today! Accepting credit cards at your ecommerce store has become a necessity. If a customer can't use their credit card to buy your products on your site then the odds are they'll just leave your site and find an ecommerce business that does accept credit cards. Credit card acceptance increases the credibility of your site and therefore your products. Accepting credit cards online requires that you open a merchant account and use a gateway processor to communicate between your site, the customer's credit card account and your merchant account. The customer decides which products they would like to buy and includes them in their online shopping cart. When a customer has finished shopping they check out. The customer inputs their personal information and their credit card information into a form that has a securely hosted connection at your site. The credit card information is then encrypted and passed to the gateway processor and sent to the customer's credit card account and then credited to your merchant account. The process is done seamlessly and the customer is probably not even aware that there has been a gateway processor involved in the transaction. If your ecommerce site offers payment by credit card it's mandatory that a gateway processor is used in the transaction. Accepting credit cards can boost the revenue from your ecommerce site. With an Ignite Payments Ventura County merchant account you will be able to do, paypal checkout, google checkout, and telecheck all through the one gateway. Get Free Software, and Incredibly Low Rates! *The offer is being made by SZASZ INTERNATIONAL, INC. restrictions apply please call for details.